Is there a special lady on your holiday shopping list who lives far away? Do you have a woman on your list who is particularly difficult to buy gifts for? Would you like to give a lovely lady a unique combination of gifts this year? Are you stuck buying a gift for your “favorite” boss or coworker whom you barely know? Does your daughter or niece deserve a special gift that is one of a kind? Would you like to finish all of your holiday shopping for all of the women on your list in just a few minutes without ever getting out of your pajamas? Did you answer “yes” to any of the questions above? Well then do I have the perfect solution for you! Gift baskets. Yes, that’s right. And we have loads of ideas and even a wonderful selection of unique gift baskets for women that we’re sure you will love. C’mon, trust me; has ChristmasGifts.com ever let you down before? If you are the type of person who enjoys making special gifts for those on your list, you have come to the right place. We’ve got some really creative ideas that are certain to inspire you this holiday season. Grab yourself a freshly brewed mug of coffee and muster up some mojo and we’ll get started. A wonderful idea for that busy lady in your life who never takes the time to pamper herself is a glorious bath and body themed gift basket. Click around our bath and body gifts category and discover unique bath products, lotions and perfumes, then hop on over to our gifts for the home and pick out a delightful candle. Add your favorite bottle of wine, find a fun gift container to arrange everything in, and voila! Is that lovely lady a movie lover? Grab a giant popcorn bowl and fill it with a couple of DVDs, a few bags of microwave popcorn, some movie theater candy and a bottle of her favorite soda. Add a plush blanket and maybe a couple of movie tickets as well. Are you looking for a little romance this Christmas? Purchase an ice bucket, a couple of bottles of her favorite wine, a package of rose petals from your local crafts store, chocolates and these unique Keepsake Coupon Tickets and you’ll be off to a great start! Or Purchase These Gift Baskets for Women instead! 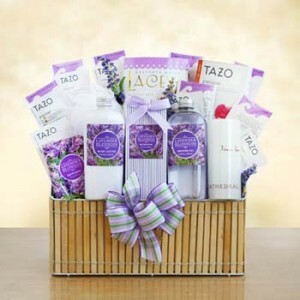 The Lavender Bath and Body Gift Basket is a wonderful way to pamper that busy lady in your life, or consider the Bath and Body Gift of the Month Club and pamper her all year long. This cookie gift tower is an excellent choice for that lady with a sweet tooth! 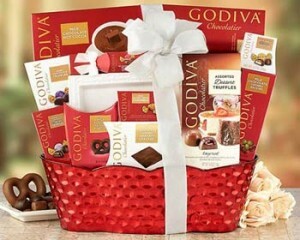 Check out our wide assortment of gift baskets for women and leave the worries to us! 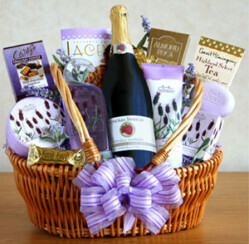 Would you prefer to make your own gift baskets or purchase one that is specially made? Let us know. These are great gift basket ideas for women. I also think that bath and body care products would make a great gift for men! You just need to pick out different scents. Soaps and body wash make a great gift for anyone because everyone uses them. On of my coworkers is leaving soon, and I want to get a nice going away gift. This idea is perfect for a coworker. Thanks for the suggestion!